The last few days I was feeling discouraged. I did not have anyone show for group on Saturday 😦 The boys and I were ready. Group had been going along with participants and great work happening with the clients and with the horses! Including Tiggs the mule who is showing up like a rock star. You never know the difference a day will make. Today, Monday morning, I have an email to schedule an individual appointment for this week or next. I also have a date to speak next week at an event called Women helping Women. (Thursday 7/23 at Port Townsend Yacht Club at 6 PM) This Wednesday we are scheduled to do Dream Theater in the pasture with the horses. I feel so blessed to do this work! I KNOW this is my calling, my whole life has lead to this point. I KNOW the power of the horses and the EGCM Method to change lives. It’s all in place, I am here living with my boys, in paradise. Something this good, and Spirit lead, cannot not succeed. It’s all about keeping the FAITH. And doing the footwork, so people know about the good work that is happening here at Leland Valley Farm. i am so grateful that I am now living at the farm with ben and sweet. i have wanted this for so long, and it has finally come to pass:) i sold my house at beckett point so i could live and work with the boys. i loved every minute at beckett point, the amazing ever changing views, of the mountains, the sky, the strait of juan de fuca, discovery bay and on and on. making a commitment to live with the boys has brought it’s own rewards 🙂 I am getting to know the beautiful leland valley farm and area initmately, seeing so many things from a new perspective. 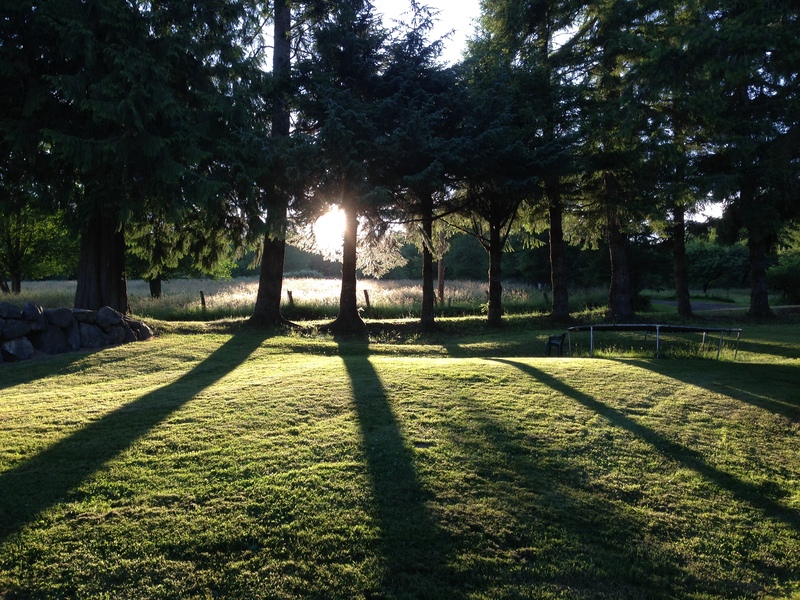 even something as simple as mowing and seeing the house through the orchard, or the evening sun through the hundreds year old cedars and the glowing grass in the field behind the trees. hearing the boys nicker and seeing them run and play from the window of my place. experiencing them opening up further as a result of sharing this time and place. often the boys like to lay down mid morning. one morning when both were laying down, sweet let me sit on his back, and even through my leg over like i was riding him. in my committing to them, i feel they are more committed to me. what a beautiful feeling. 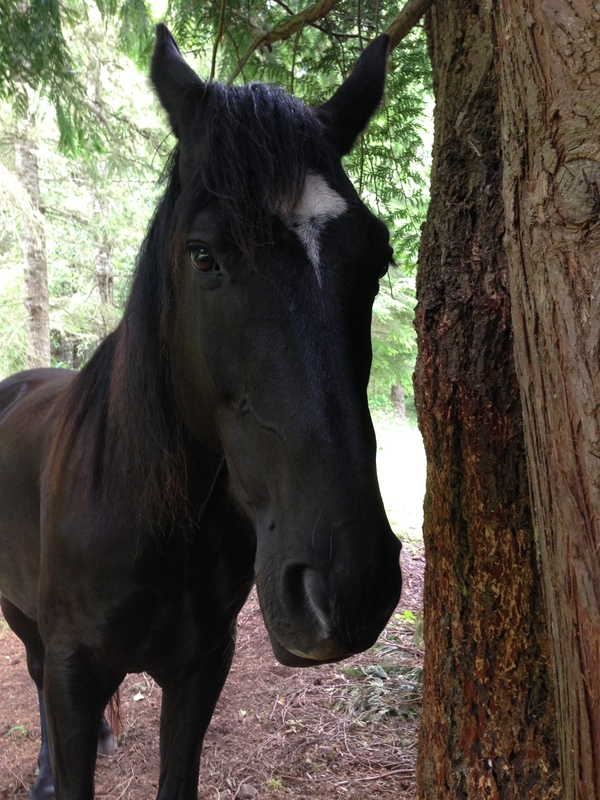 i am also getting to know the surrounding area with trail rides and adventures. appreciating the cool shade, and the amazing northwest flora and fauna. 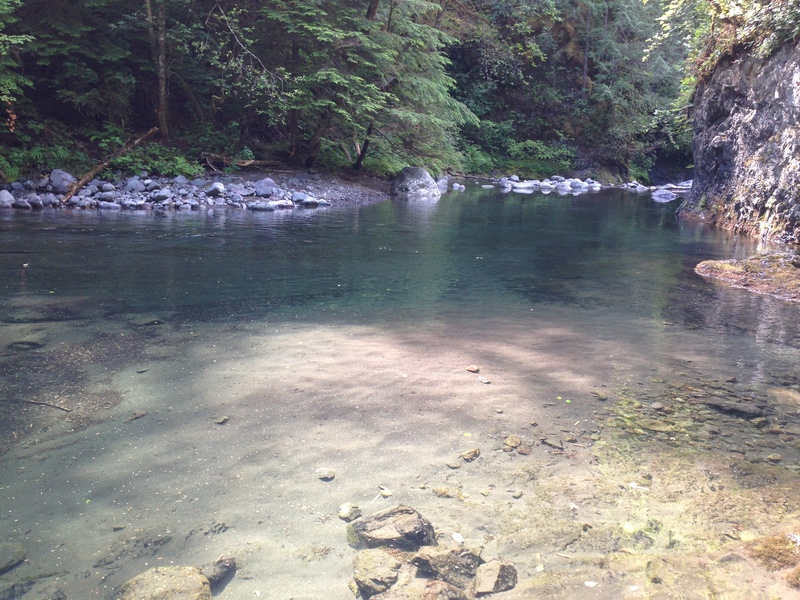 I am finding all the best swimming holes and places for our overnights and women’s adventure retreat. it’s all good and getting better. the boys and i look forward to your visit, whether it be for a group, individual session, an overnight or retreat, or a customized adventure, we have so much to share with you! who is it i speak of? there is no doubt fall is here, the leaves are changing along with the weather. 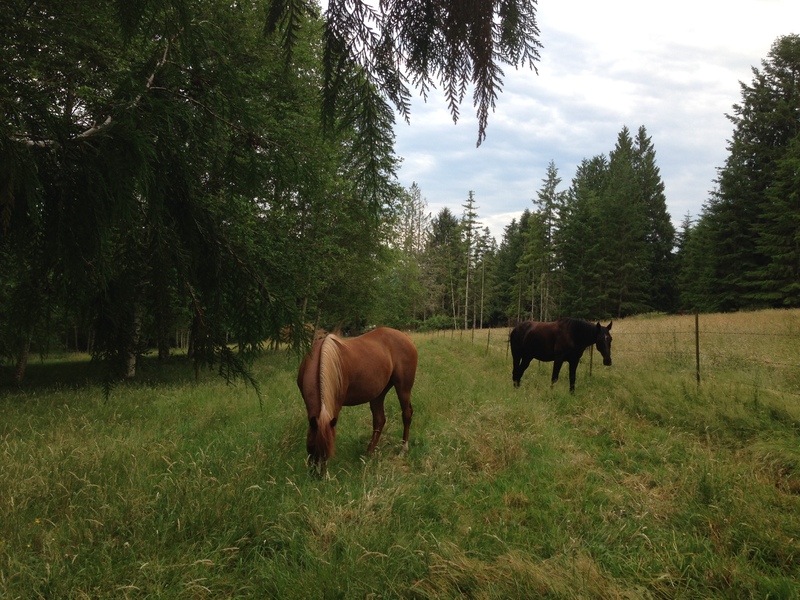 it is a beautiful time to be out with the horses or riding on the trails. It has been a full year for empowerment through equus, me and the boys and all of our lovely clients. the year started out with rIck brighton coming to the peninsula to facilitate a gaited horse clinic. there have been many individual sessions in the pasture with Sweet and Ben. always varied and always powerful for the clients. We have a committed group of women and new ones joining our saturday group, there has been much growth and support, fun and laughter along the way. tiggs the mule is one of the group members new favorites. 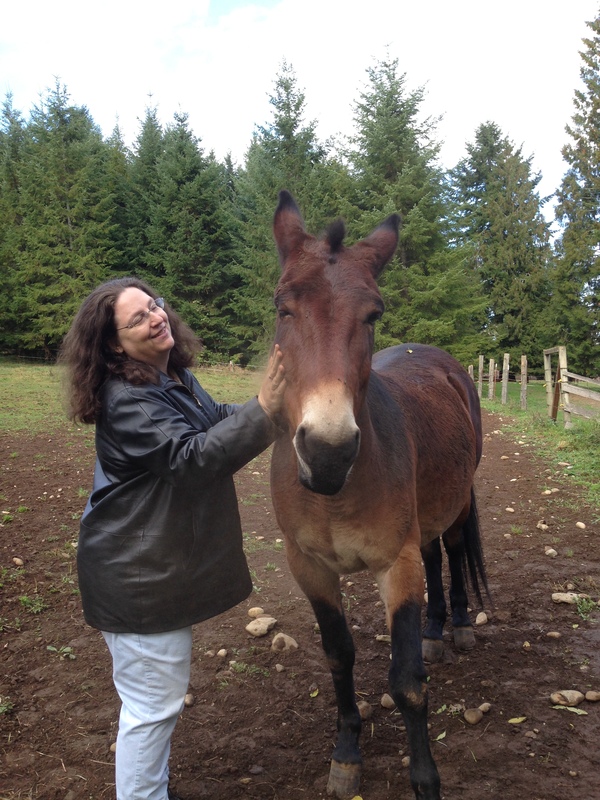 kim levinson taught reiki for humans and horses in the spring, we even got to watch one of the angus steers enjoy reiki. we also had a children’s day in the spring that was well attended and had a chance to enjoy all of the animals on the farm. 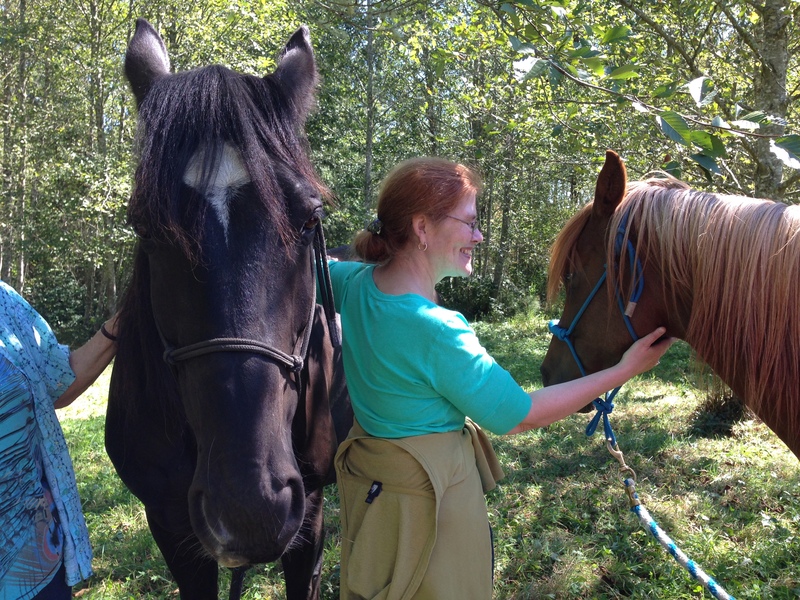 jan haliday from the port townsend leader came out and wrote and piece on the work that happens at the farm with the horses showing up for humans in ways that surprise and delight and bring healing and forward movement. as i write i realize that the happenings this year have been many. melisa pearce published an article about empowerment through equus in her newsletter and i had a poem published in the 2nd anthology touched by a horse, equine gestalt coaching stories. and a group of grads published a book, year of the horse, with horse photos and quotes, which i am a part of. i had the opportunity to travel to calgary and denver to further my training as an equine gestalt coach, and spend time with many fellow coaches and horses along the way. this weekend we are planning an overnight with the horses, including sleeping under the stars, dinner on the fire and a night hike. there is still time to sign up for this event. as the fall nights get longer, i will be planning for next year, including bringing more equine gestalt coaches to the leland valley ranch, and providing more exciting opportunities for participants. we will continue group and individual sessions and special workshops through the fall and winter protected by our natural barn, the hundreds of year old cedars and some cozy by the fire. Happy Spring to all! The grass is growing, the birds are singing, the frogs are serenading, the crocuses are blooming. The air is feeling warm, (most days at least). A lot has happened and a lot is coming up! We had a great gaited horse clinic with Rick Brighton yesterday. We will schedule another date with Rick for early fall. 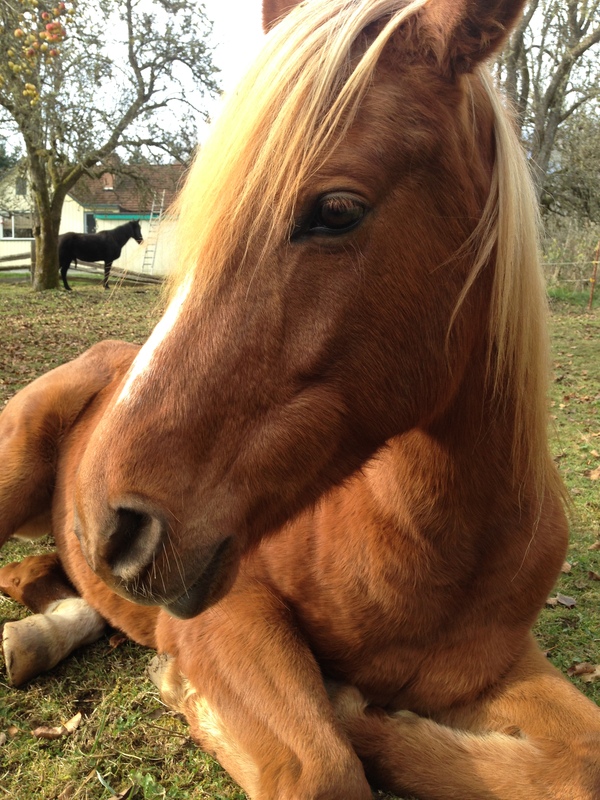 Kim Levinson Reiki Master will be presenting a 1 day Equine Reiki Workshop on April 12th. Due to much snow and other factors, Angie delayed her Mindful Horsemanship Clinic to May17th. The next day on the 18th Angie and myself will offer coaching with the horses, for whoever would like to participate. We have Ashara Morris coming to WA on May 10th and 11th for another Can you Hear them Speak? And May 31st-June 1st I will be flying to CO to co facilitate with Ashara Can you hear them Speak. We have Genogram, Temperament and Overnight retreats coming up this summer.The boys and I look forward to seeing you again, and or meeting you! So much news to share, It has been an amazing summer, with fabulous WA weather! Lots of groups and individual sessions at Leland Valley Ranch. 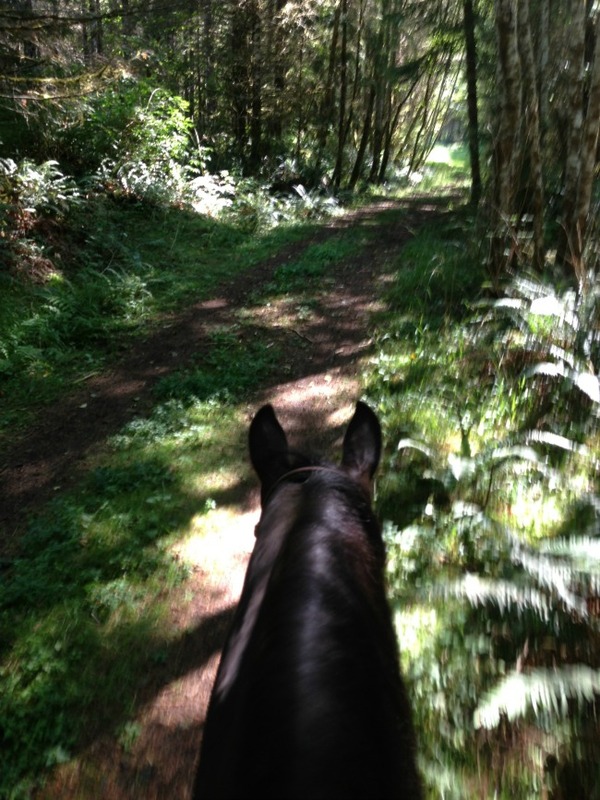 Lots of trail rides through the forest on the logging roads. 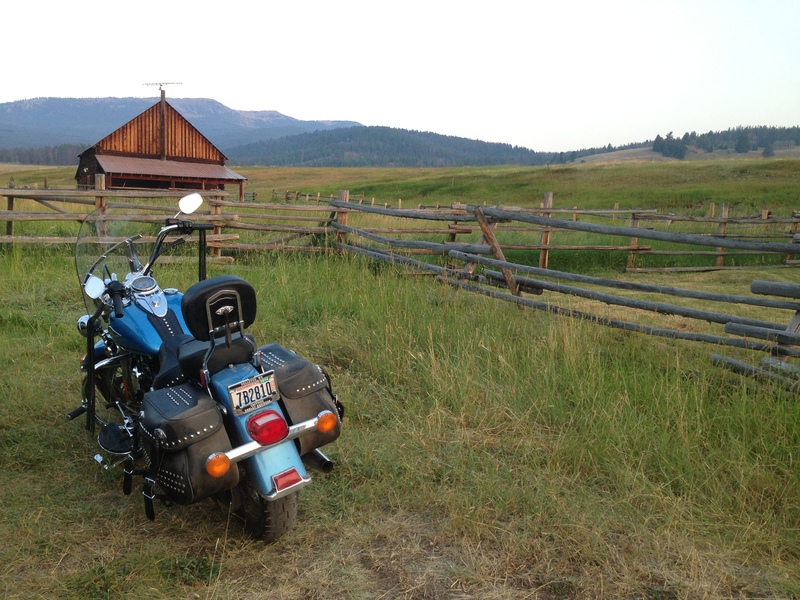 August brought a bike trip to MT, 1700 miles of back roads, sleeping under the stars, swimming in rivers and streams. A mostly graduate CORE training with coach Peggy MacArthur and mentor Melisa Pearce at Jamie Stoltfuz’s, ‘Spurring Change’ 6800 acre Ranch in Philipsburg, MT. 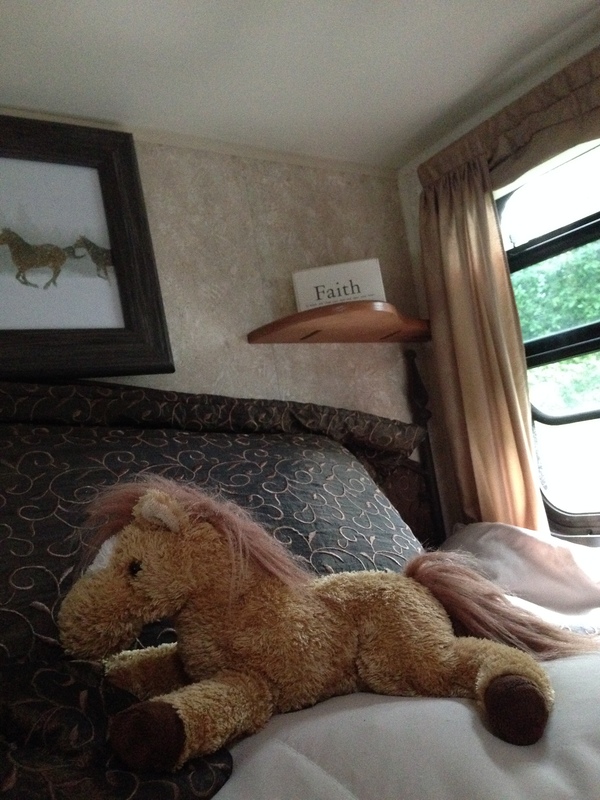 2 weeks of the outdoors, riding, horses, coaches and coaching! It was fabulous! Got to spend time with EGCM Coach Brenda Westwood, ‘Horse Sense Healing’ at her ranch in Kila, MT, and work with her horses Jet and Frankie. Both awesome healers, Jet is a grey Arab and Frankie a Quarter horse Arab cross. Also got to spend time in Spirit Lake, ID with EGCM Coach Maarten Homen, ‘Equitruth’ more coaching. And came home to my good friend and EGCM Coach from Calgary Jocelyn Hastie of Celestina Ranch and ‘Unbridled.Ca’ We both worked with Sweet and Ben at the Leland Valley Farm. What an amazing 2 weeks. Everyone and everything I love best! And more learning to share with my clients! Fall is here, today is the autumnal equinox. As I rode Ben through the forest, the ferns were glistening lite up by the filtered sunlight, after a brief shower. The big vine maple leaves crunched under hoof. There was more light in the forest, as the leaves were starting to thin. It was very still and quiet, it felt distinctly different than our summer rides. Change is in the air. Lastly, I am very excited about our upcoming Weekend Retreat, October 19th and 20th. Ashara Morris EGCM Coach and the Pet Yente is coming up from CO to co-facilitate a weekend retreat learning to deepen your communication with your animal. We will have many animals to practice with at the Leland Valley Ranch and neighboring ranches. Contact Lisa or Ashara at http://www.harmonysheartfarm.com for more details.